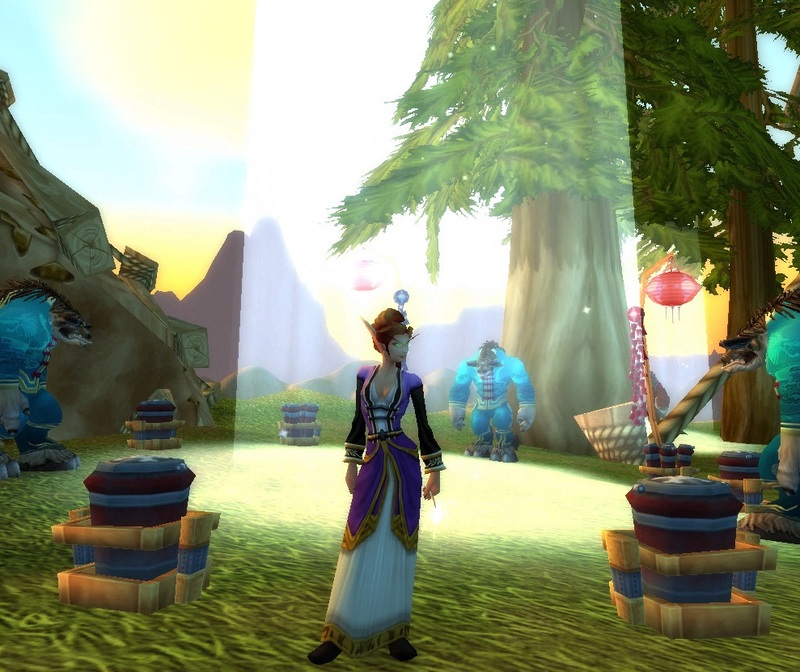 Much like the in-game event Harvest Festival, the Lunar Festival focuses on honoring heroes and wise leaders of ancient times, but with much more of a bang! 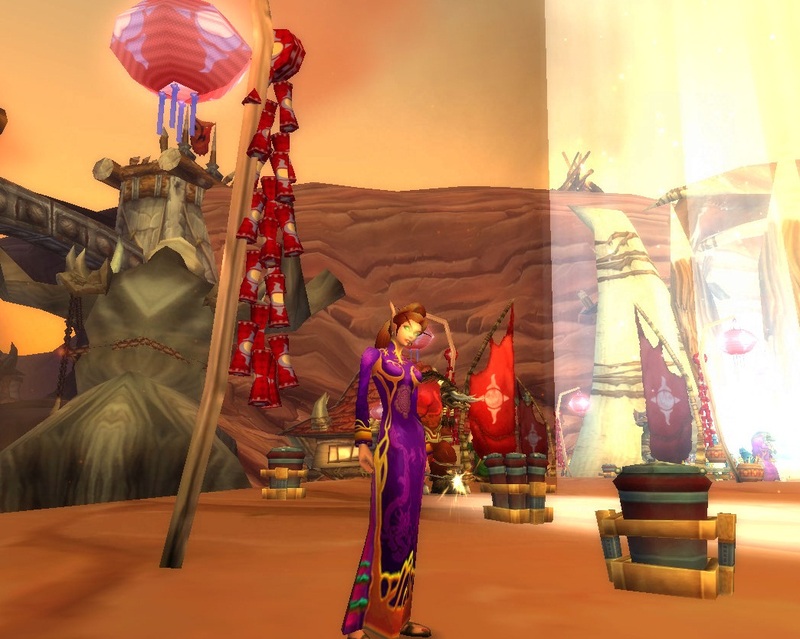 Honor the Elders scattered across Azeroth to receive Coins of Ancestry to buy Lunar Festival wares from the event vendors. Aside from the “given” Festive clothing, Kirina has a couple of other outfits for this event. 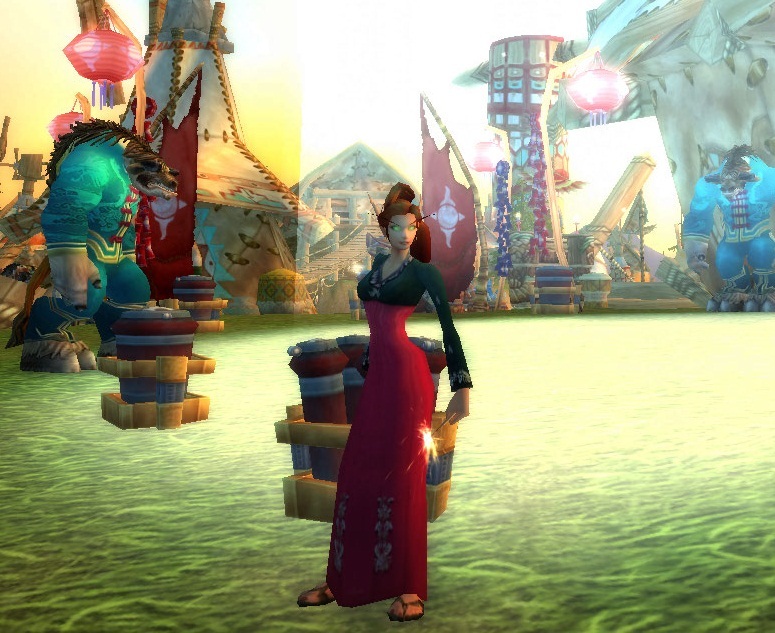 Because the Lunar Festival is based upon the real life Chinese New Year celebration, I kept Kirina’s alternative outfits somewhat in the realm of being oriental (not to be stereotypical) to stay within the theme of both the in-game, and real life, festivities. What lovely dresses the Festive Dresses are. 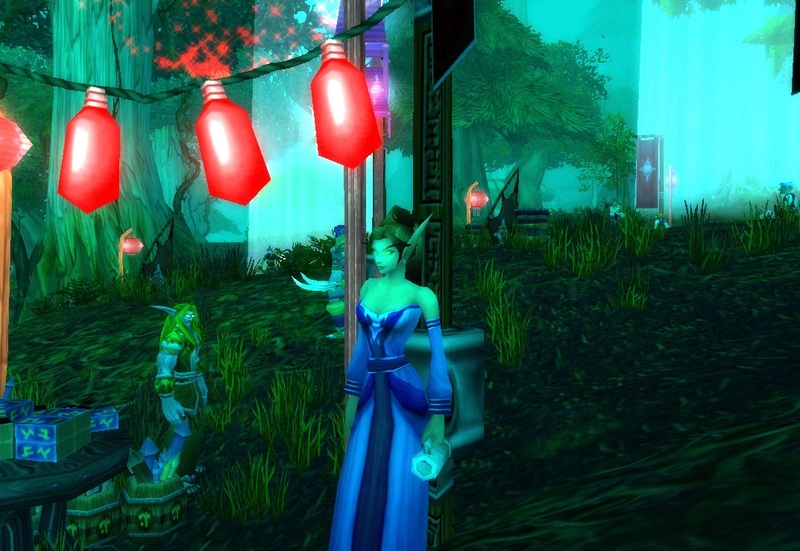 I especially like the Festive Green Dress, as it matches Kirina’s eyes perfectly. Of course, there are more colors to choose from other than what I have shown. Another dress option to buy is the Festive Pink Dress (as seen in the post picture to this article), and there is the Festive Teal Pant Suit to choose from, as well. 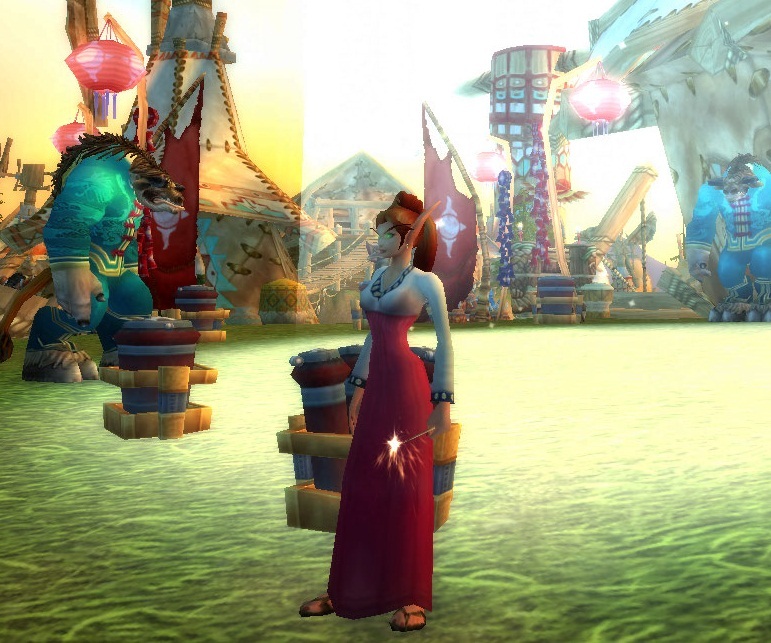 Tailors can buy both the Festival Dress and the Festival Suit patterns from Fariel Starsong during the event; they teach how to make the lovely red versions of the festival ware – the Festival Dress and Festival Suit. 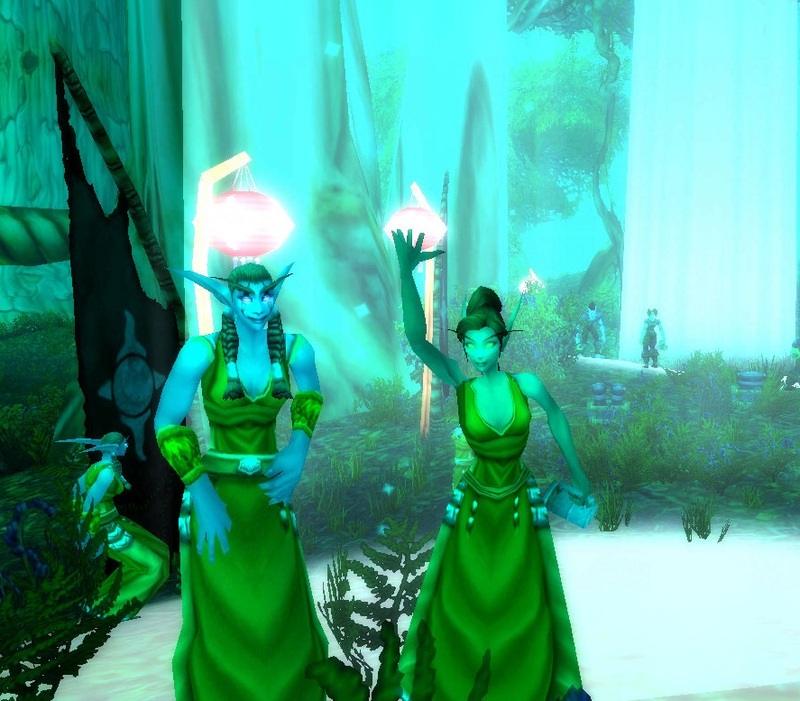 To see all the Lunar Festival clothing items, as well as standard outfits for other holiday events, head to Kamalia’s great reference post on the forum: Party Clothes! 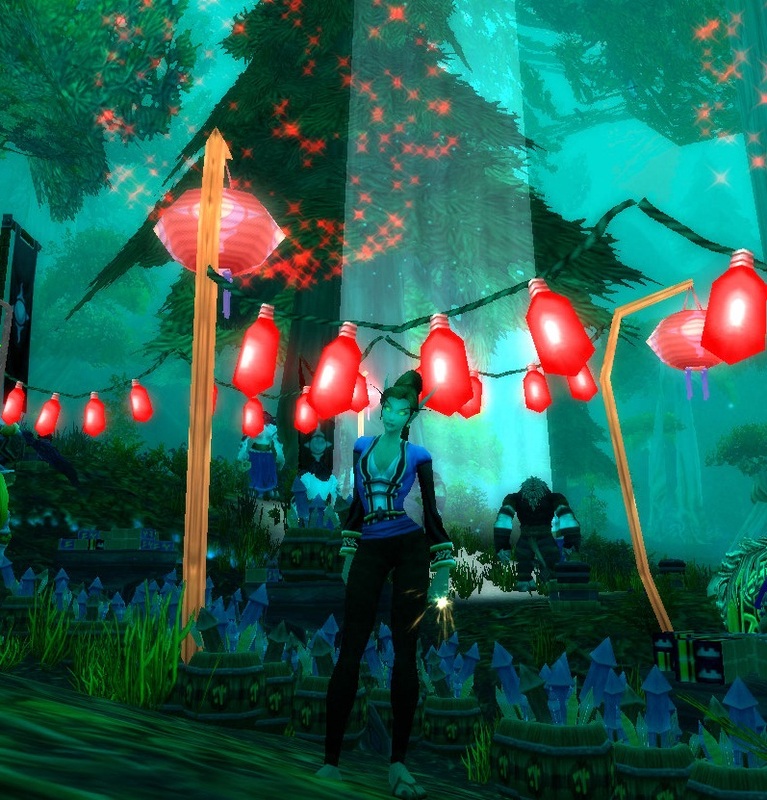 However, be wary of wearing red shaded clothing, as any red hue will be skewed somewhat in Moonglade’s predominately forest green atmosphere (well, at least it is on my computer). 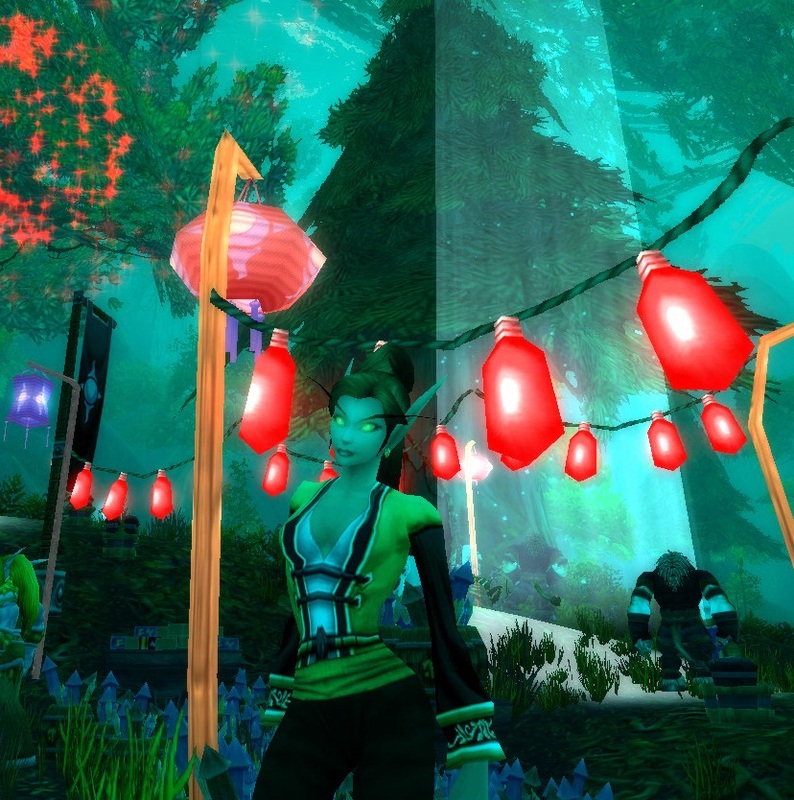 To get the full color effects of these particular clothing items, head to your home-town’s own little lunar festival. 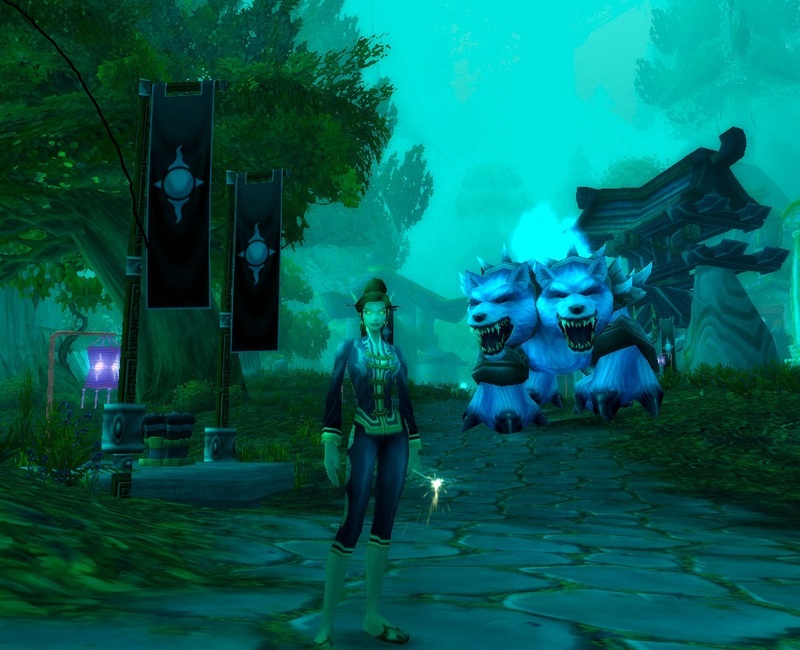 Want something different than the run of the mill Festival Dress, but want to keep in with the Lunar Festival spirit? 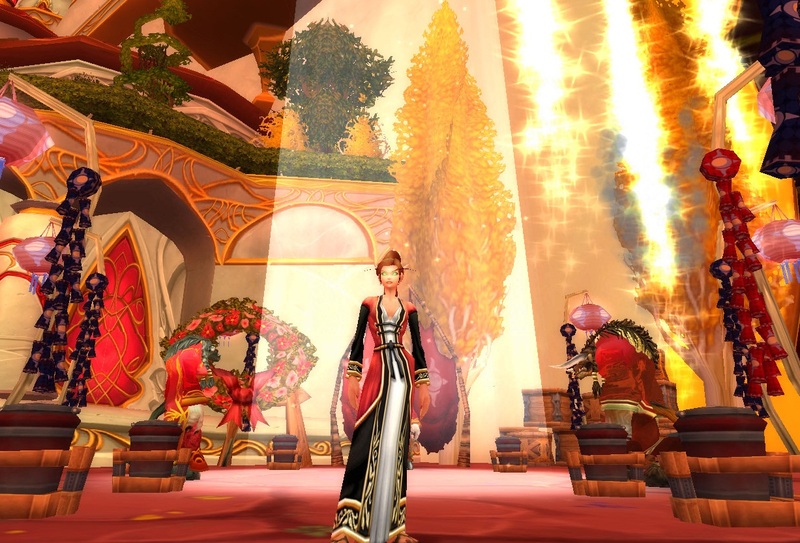 Robes like the Imperial Red Robe are a great alternative to have to wear. 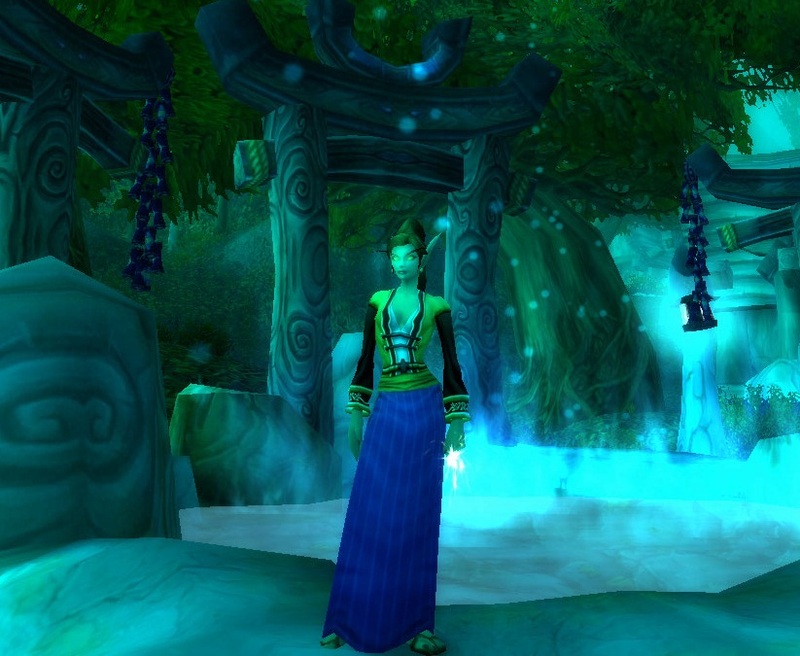 The Imperial Red Robe is a fairly low world drop, as are its different color equivalents, such as: the Councillor’s Robe (green), the Mystical Robe (purple), or the Mindsurge Robe (blue) (more alternatives can be seen in Kamalia’s other forum reference post: Azeroth Dress Catalog). A little bit stretch, I know. But, the purple colors in the shirt and kilt blend perfectly together. I added the Dress Shoes in attempt to tie in the black sleeves of the shirt with the overall outfit. You could also add a belt like the High Councillor’s Sash to cover the gold to black transition around the waist. While any type of matching belt would do, I personally love the look of the simple cloth sashes, like the High Councillor’s Sash, for this type of outfit. This same look can be had in green…. 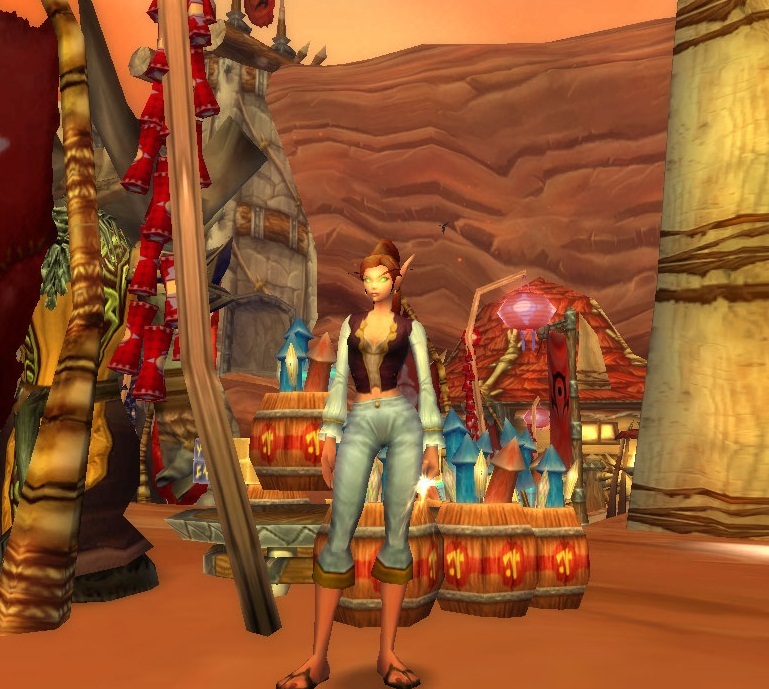 The Captain Sanders’ Sash is the only belt in this style to have other alternatives – the Apothecary’s Waistband (Horde vendor), and the Swashbuckler Sash (neutral quest reward). I do not know any alternatives for the green and purple sashes, if there are even any out there. The pantaloon’s fancy embroidery along the pant legs is not unlike the thread-work in the Festive Pant Suits; it also matches the design on the cuffs of the shirt. There are also the Blue Martial Shirt, the Yellow Martial Shirt, and the Orange Martial Shirt (tailored made) to wear as well. To my knowledge, they do not have a corresponding color in the same style as the ones used in these outfits, but, and matching belt would work just fine. The high neckline of this robe is similiar to that found in the Festival Dresses and Pant Suits. I also find the lotus-like flower printing on the robe to be Eastern in style. 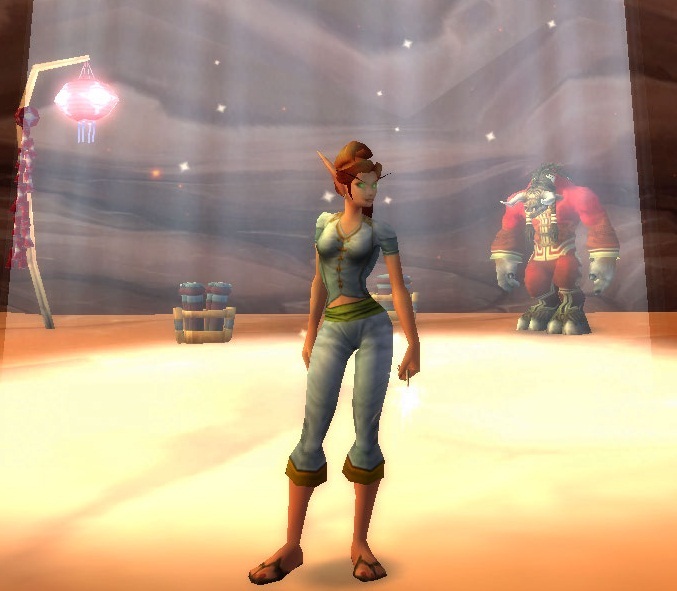 This robe is crafted by tailors who looted the rare pattern from The Mechanar dungeon in The Outlands. 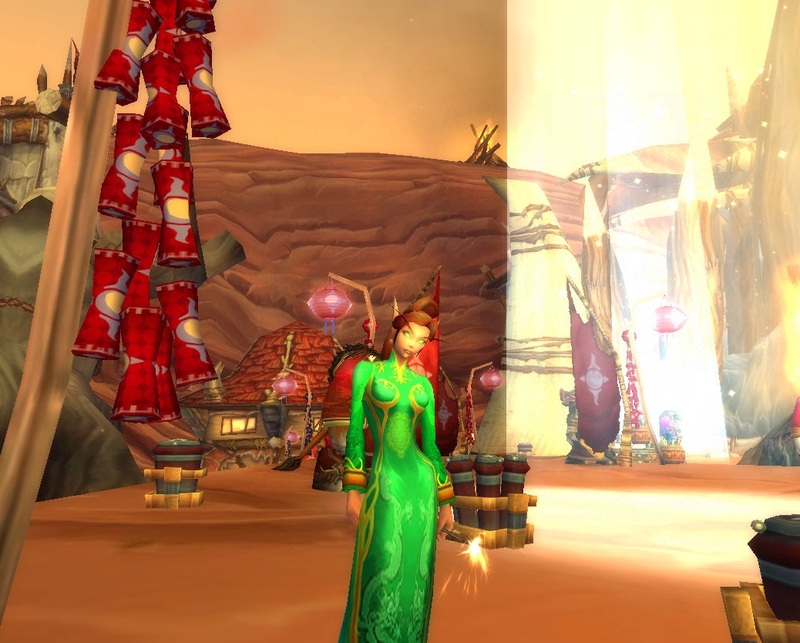 This same style of robe can be found in others like the Robe of Volatile Power (red/purple color), or the Embrace of the Wind Serpent (brown/green). 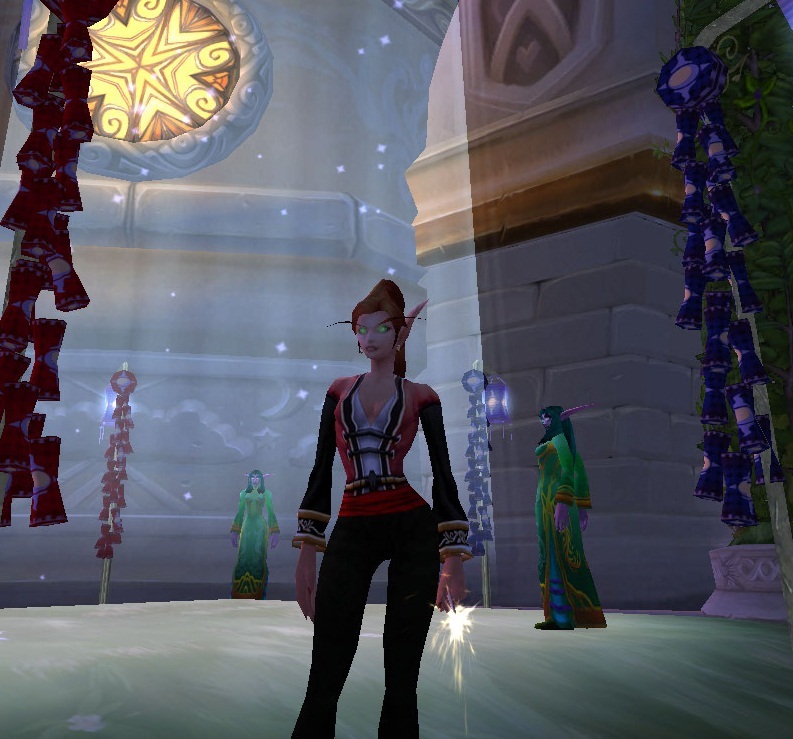 But for some simpler robe alternatives, let’s not forget the lovely, vendor bought hanboks to wear. There are a couple other colored hanboks to consider, like the Red Traditional Hanbok and the Green Wedding Hanbok. Also sold by these various vendors are the Royal Dangui, and the extremely rare and beautiful Formal Dangui. 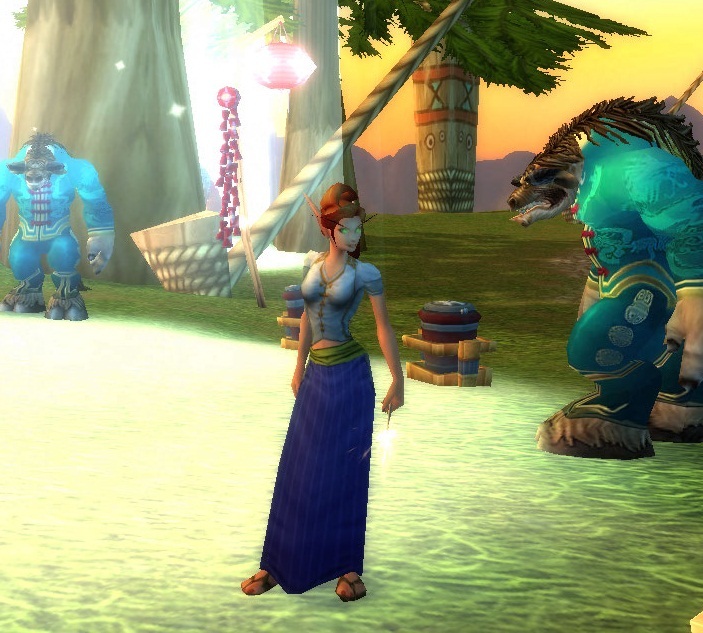 To stay a little bit more simple, some of the starter robes for the different classes make awesome festival wear. 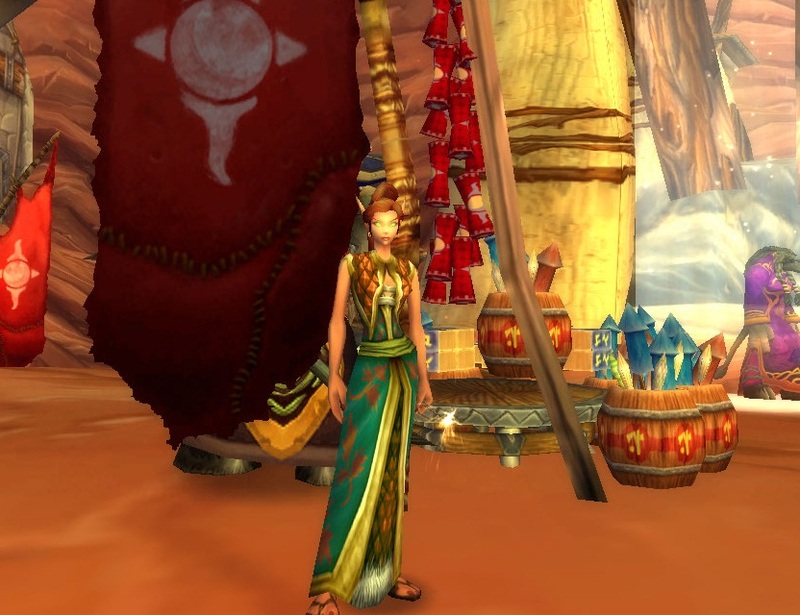 The Neophyte’s Robe is the same robe the Darnassus Revelers wear; however, they have on some other armor items that I will have to investigate into…possibly for an article ^_^. 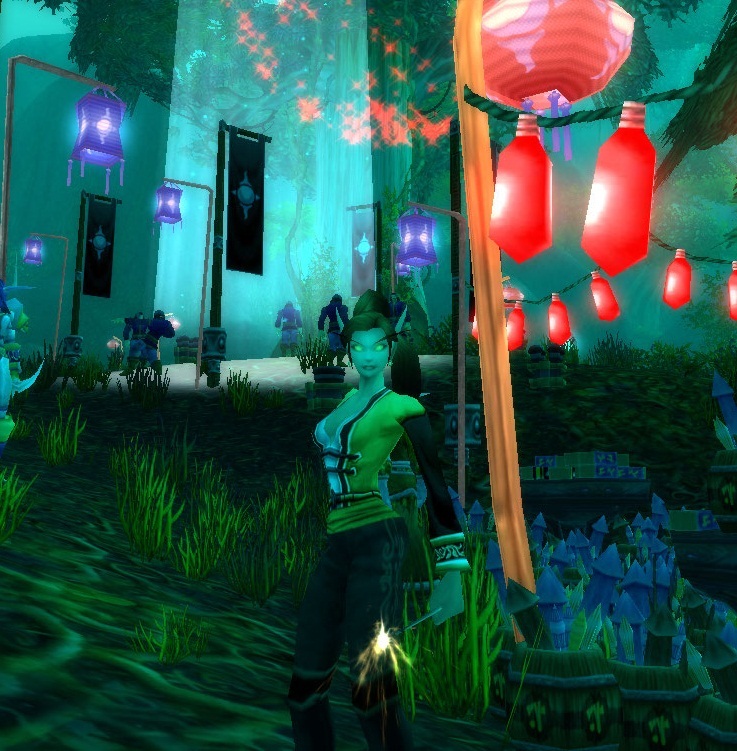 I don’t have a pair of purple pants on Kirina, but, the vest pairs up nicely with the Aurora Pants. 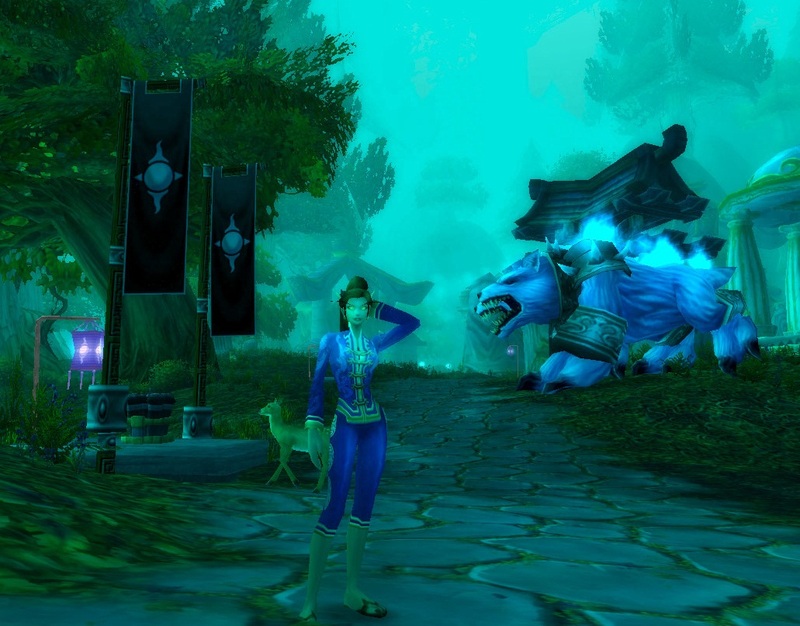 For another vest in the same color and style, try out the High Councillor’s Tunic. The main pieces of the Aurora set worn together also makes a lovely alternative to the Festive Pant Suits, especially with the high, Mandarin neckline of the chestpiece and the gold embroidery throughout. If white is not your color but you like this style, consider the blue Royal Set as a perfect alternative. Now to a couple of Simple Kilt outfits! These share the same style as some of the previous “main” outfits – simple, yet, festive! 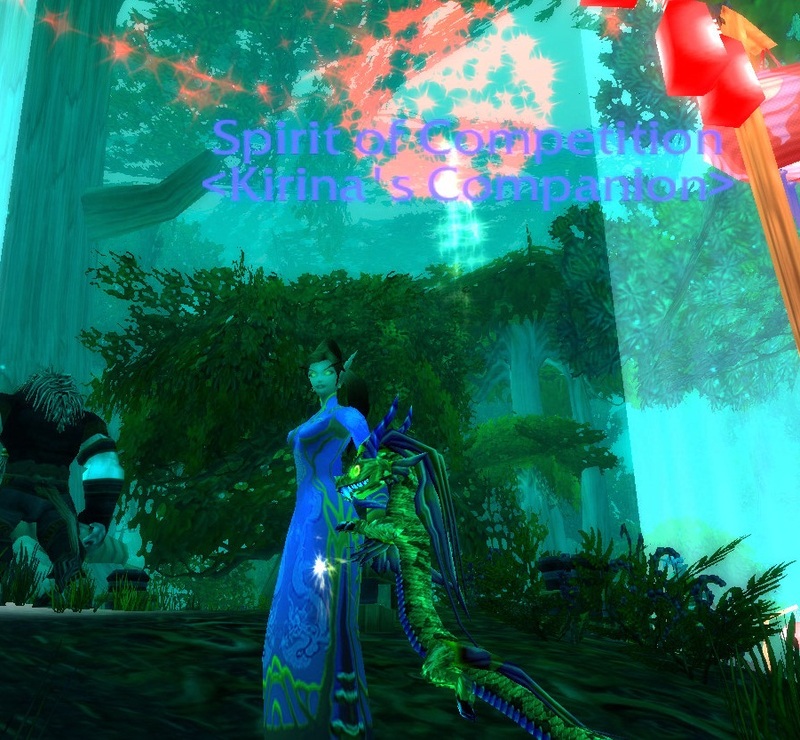 Kirina and her Spirit of Competition companion. This little Eastern dragon is your perfect companion during this celebration.